CHTM walking tours for Dublin Book Festival 2013. | Come Here To Me! CHTM walking tours for Dublin Book Festival 2013. 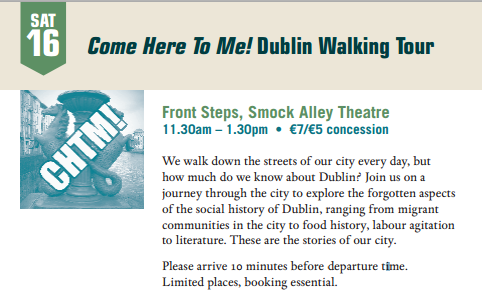 As part of this years Dublin Book Festival, and to promote our own book ‘Come Here To Me: Dublin’s Other History’, we are carrying out walking tours with the DBF team on November 16th and 17th. These tours will look at unusual aspects of Dublin’s history, as featured here on the blog over the years. Tickets for the tours can be booked here. There are a whole series of great events being organised to promote new and established Irish authors, and the entire festival programme can be read here. Will you be covering similar things to on the one last Christmas or different things? Will see you there so!